In the last post we discussed how CTS is diagnosed and nonsurgical treatment. Part two discusses the surgical treatment for carpal tunnel syndrome. Surgical carpal tunnel release remains the standard of care for severe carpal tunnel syndrome or when conservative treatment modalities have failed. Unfortunately, there still seems to be a great deal of fear and misinformation surrounding carpal tunnel surgery. Today carpal tunnel surgery can be performed with local anesthesia, with the patient wide awake, eliminating the need for fasting or an I.V. Many patients who have local anesthesia will come to surgery alone and drive themselves to and from the surgery center. For those patients who are still anxious about being alert during surgery, oral and I.V. sedation can still be made available. 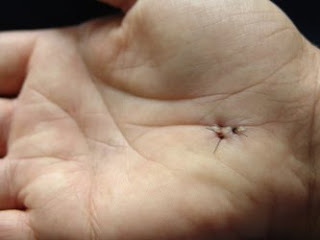 Mini-incision carpal tunnel surgery is performed with the patient lying flat on their back with a small tourniquet on their forearm to prevent bleeding during surgery. A small half inch incision is made at the base of the palm and through this incision the transverse carpal tunnel ligament is divided in half, essentially opening the roof of the carpal tunnel and removing the pressure on the median nerve. Once the ligament is divided, the incision is closed with only one or two stitches. The entire procedure usually takes only 10 to 15 minutes. Following surgery, a light, soft dressing is applied, with no splint, and is worn for four to five days. Once the dressing is removed, a simple band-aid can be used to cover the incision to protect the stitches. After surgery patients are encouraged to move their wrist and fingers frequently and use their hand as tolerated. Many patients return to work and normal activities the day after surgery, although a couple of days of rest and light duty are not uncommon. The stitches are removed 10-14 days after surgery and most patients have significant improvement of their symptoms by the time they are seen for the post-op appointment. Once the carpal tunnel is released, recurrence of carpal tunnel syndrome is rare. Today both surgical and non-surgical treatment of carpal tunnel syndrome is relatively safe and simple. Surgical treatment has a very high rate of success and patient satisfaction with a low rate of complications and risk. Non-surgical treatments, while not a permanent cure, can provide significant relief of symptoms. If you are one of the millions affected with carpal tunnel syndrome, talk to your doctor about your options or get an opinion for a specialist. Post provided by Robert Foster, MD. In 2009 over one million people sought medical treatment for carpal tunnel syndrome (CTS). It is estimated that carpal tunnel syndrome affects nearly three percent of the population, or over 8 million people in the United States alone. Despite simple and effective treatments, many people continue to needlessly suffer with symptoms of CTS. Carpal tunnel syndrome is caused from compression of the median nerve as it passes through the carpal tunnel at the wrist. The median nerve is responsible for supplying sensation to the thumb, index finger, middle finger, and part of the ring finger. Compression of the nerve causes slowing of the electrical signal that can result in a multitude of symptoms, such as numbness, tingling, burning, aching, weakness, and radiating discomfort up the arm. Carpal tunnel syndrome is not caused from working on the computer or repetitive key stroking. In fact, most cases of CTS do not have an exact identifiable cause. However, repetitive motion activities, such as typing on a keyboard, can aggravate carpal tunnel symptoms in those who have it. Conditions frequently associated with or cause an increase risk of carpal tunnel syndrome include pregnancy, obesity, trauma, smoking, diabetes, hypothyroidism, rheumatoid arthritis, and kidney disease. Treatment of carpal tunnel syndrome can be conservative or surgical. Conservative treatments include splinting, therapy, oral medications, and steroid injections. Splinting and steroid injections are the most common and effective conservative measures. Splinting is effective because it prevents excessive flexion of the wrist, which can increase pressure on the median nerve within the carpal tunnel space. Steriod injections into the carpal tunnel space decrease inflammation and swelling, which relieves pressure on the median nerve and improves blood flow to the nerve tissue. While usually not a permanent cure, steriod injections frequently can improve symptoms for a prolonged period of time and are often used in conjunction with wrist splints. Physical therapy and oral medications are less effective for the long term treatment of carpal tunnel syndrome. Other therapy modalities such as laser therapy, heat therapy, and chiropractic care seem to have less or even no effect.